Armor, armor, armor, armor, armor Chameleon! Anyway. It is something we’ve seen, one of many uniques we’ve seen fielded and lost in the last weekend in fact. Uniques have, as the competition gets fiercer, made a surge, with 8 fielded and 3 destroyed. 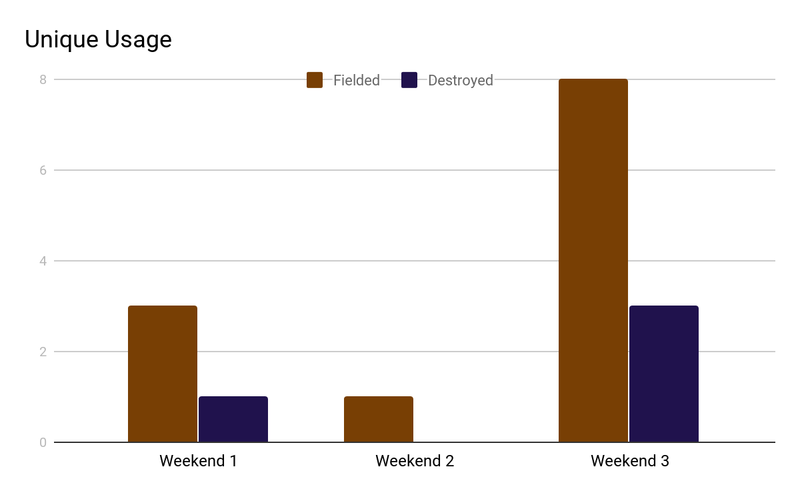 This leaves the recent weekend accounting for 66% of Uniques fielded and 75% of them destroyed, with 50% of Uniques destroyed being in a crucial match between VYDRA RELOLDED and Northern Coalition.. For a weekend that only accounts for a little over 20% of the matches played so far this shows the lengths teams are willing to go to win. One of the best examples of this is in match #117b between VYDRA and NC. where both teams fielded a Rabisu with NC. additionally bringing their flagship. Overall 401.92B ISK was destroyed in that match with 400.06 being the two Rabisus. 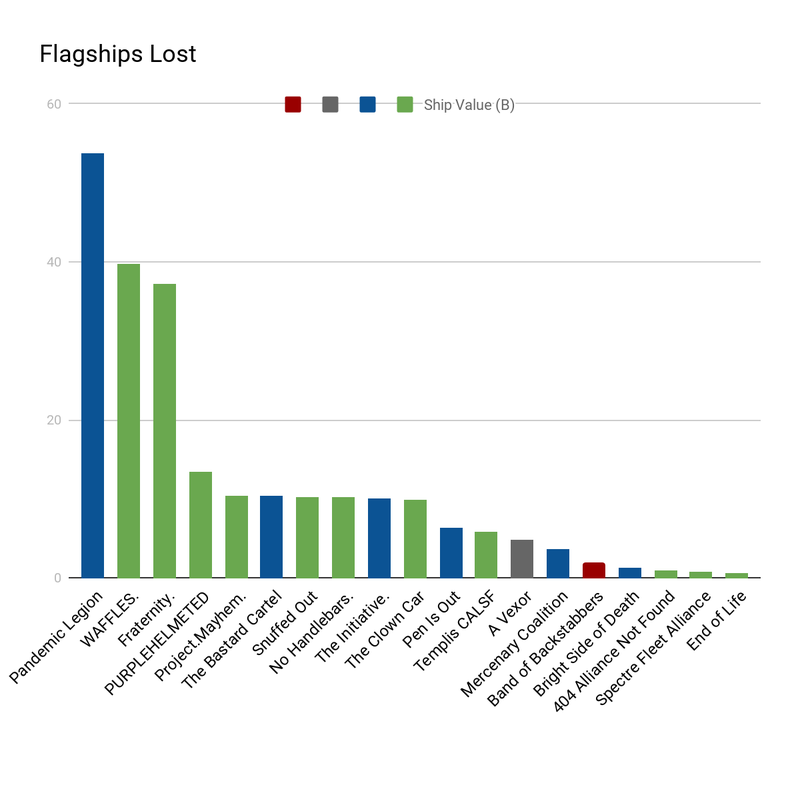 (Standard disclaimer should go here about unique ships being a limited market and so zkill’s approximation of their values are approximations only). With the winner of that match securing themselves at least 14 prize ships from this year’s Serpentis offering, the value of the match was beyond doubt. 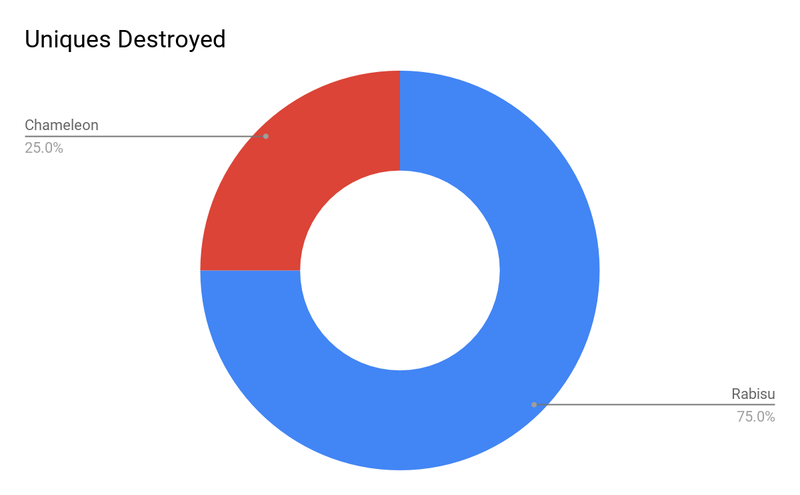 To put its cost in greater perspective though; 1.264T ISK has been destroyed through ATXV so far, 32% of it in that one match. The entire #117 series between these two was a bloody, expensive mess indeed, with 44% of the entire ATXV ISK lost being lost in that undefeated semi-final, 98.9% of that value being the 3 uniques lost (2 Rabisus and a Chameleon). The overall cost being around 55x more than that of the other undefeated semi-final between L A Z E R H A W K S and Pen Is Out, despite the loss of the Pen Is Out flagship. We’ve seen a disappointingly low number of unique ships fielded this year, with only 3 species of them fielded. This is in part a knock-on from the AT XIV rule addition limiting the number of uniques that a team fielded to 1. Such a rule especially hits comps like double Moracha or teams that would add ships like a Malice to their support wing while also bringing valuable ships higher up. Last year’s prize ship the Rabisu is making a good showing; providing both a stronger option and a dodge ban in the hotly contested group of Armor Logistics Cruisers it’s seen use by 7 different teams across the 8 matches it’s seen. Northern Coalition. are the only team to have fielded one more than once, with the loss of one to VYDRA mentioned above. Second is the Chameleon, a once overlooked ship given new life by the return of T2 damage drones in the ATXV rule set. With its full damage potential realised we’ve seen the Chameleon warrant both use and bans, with two distinct use cases. VYDRA and HYDRA have both seen success with it in ECM heavy compositions where the Chameleon’s more unique ECM bonuses come into play. However, this involves off tanking the 7 mid, 4 low ship, though a lack of the traditional Gurista’s shield tank bonus makes this less painful. Finally, we have perhaps the AT prize ship to end all AT prize ships: the Etana. We should give all due reverence to one of the few remaining Etana, fielded only once by a team with a history almost as storied as the Etana itself. The Etana was originally awarded to the victors of ATX and is in essence a Basilisk, identical or better in all ways, but, 1 --okay, maybe 2 --3, I should do research before starting sentences: weaker sensor strength, reduced agility, and price. Otherwise, the Etana brings more speed, lower sig, --4, absolute capacitor is down, 5, power grid-- Where was I? Oh, yes. Better cap regen, drastically reduced cap usage, more slots, better CPU, and slightly better logistics rep range. I mean, that’s the biggest point, right? The biggest point is actually the 17% rather than 15% per Logistics Cruiser level reduction to the activation cost of logistics modules, resulting in a 40% lower activation cost at level 5 compared to a Basilisk. For now, the Etana, fielded in the infamous Etana-Widow Pseudo Tinker, #104, has avoided death. 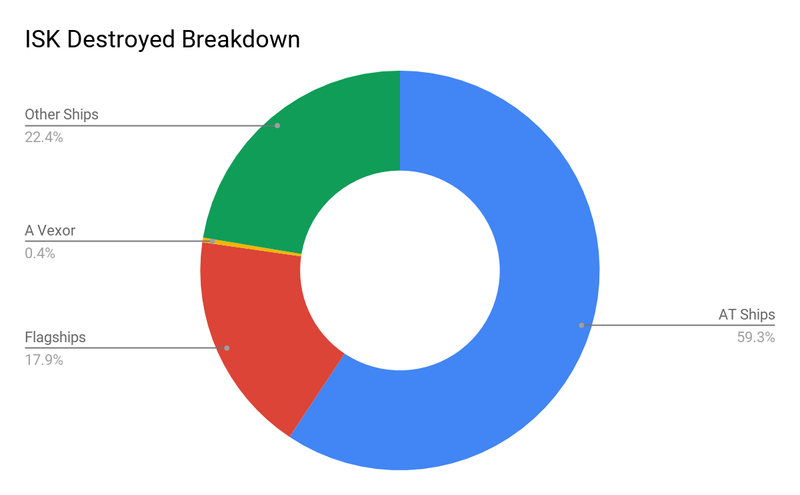 The other Uniques haven’t had such luck with 4 being destroyed so far, accounting for a little under 60% of the ISK lost in total. The Chameleon we have seen die is sadly not one of the Armor Chameleons that has sparked so much discussion around the EVE_NT virtual office this last week. It was, however, a completely ECM free shield tanked fit fielded in an All-In comp, so, you know, that actually happened. A rule-based addition to ATXV and specifically the 3rd weekend, and coming 4th, is the third ban. One of the biggest boons of this is the ability to ban all 3 Armor or Shield T2 Logistics Cruisers, previously impossible for a single team to do. It also allows more targeted bans at the Unique ships that begin to be fielded. 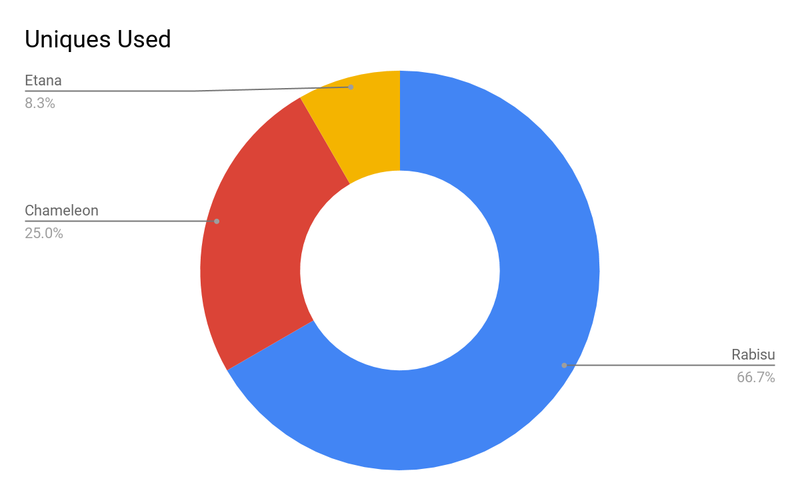 This has been shown with 69% of all bans on Uniques being crammed into 20% of matches, though 28% of all bans occur in those matches due to the 3rd ban. On the other side of the Uniques coin are the more artificially unique Flagships, a product only of the Alliance Tournament rules. 6 remain, with 4 confirmed and 2 yet to be fielded. Monospecied, only Bhaalgorns remain, the two missing from the Top 8 teams that remain are the dead flagship of Pen Is Out lost in #117a to L A Z E R H A W K S and the undeclared flagship of BRAVE Collective, lost in a pile of paperwork in the lead up to ATXV. 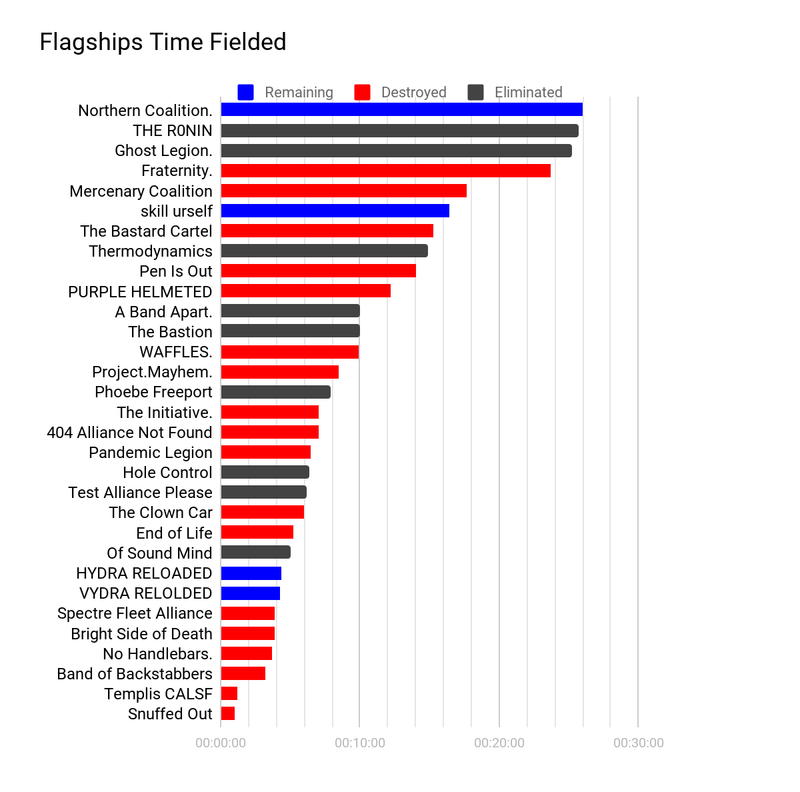 All the dead flagships can be found in this increasingly crowded graph, with the new additions highlighted in blue. 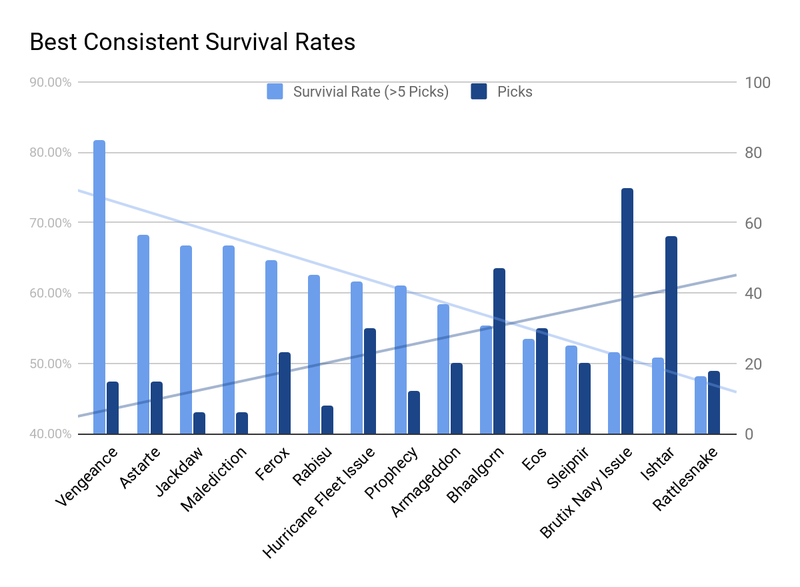 Interestingly, despite the more valuable wins as we near the pointy end of the competition we are still seeing all values of flagship die, the Armageddon of Bright Side of Death tipping the scale with a mere 1.32B of bling while the Pandemic Legion offering, a Bhaalgorn of course, weighing in at an estimated (see above disclaimer about zkill values given the rarity of the modules fit on such ships) value of 53.66B ISK far more in line with what we might expect at this stage in the AT. PL have, at least, this dubious first place to take home, for the moment. Overall, flagships this year have been a mixed bag. With only a 50% win rate they haven’t seemed to command matches the way, some might have hoped. The true and devastating power of the flagships is far from what we have seen on the field, however, at least judging by the loss mails, with few of those seen reflecting the potential of the species. Increased demand for the requisite components no doubts driving this potential beyond the reach of most. However, I’d like to look at an interesting metric I’ve tracked in the background this year: time fielded for a flagship. Looking sad at the bottom of the table Snuffed Out and Templis CALSF both lost their flagships within 90 seconds of their first fielding, 62 and 74 seconds respectively. At the other end of the spectrum, NC. has fielded their flagship for 26:02 across 3 matches, all piloted by DHB WildCat. Their closest remaining competition at 16:28 is nearly 10 minutes behind, with all other remaining flagships far further behind so their record may yet stand. The 3rd weekend has brought the flagships out of the woodwork less so than uniques however. 18 times they were fielded out of 49 times overall, accounting for 37% of all sightings. With only 20% of the matches being played last weekend, we are certainly seeing more of these flagships. Despite this only half of the remaining teams have shown one. Xoorauch Destroyer, the HAWKS logistics pilot, has never survived a match that L A Z E R H A W K S have won. This fact remains true despite a fairly solid second victory over Pen Is Out in Sunday’s best of 3 where Mr Destroyer MJDed to 124km from the centre beacon and coasted out of the arena a mere 40 seconds before the match was closed out. Though widely believed he could have lived within the confines of the match the team has begun to doubt if his psyche would ever have truly allowed him to survive the match. Firstly the win rates of popular ships. The Exequror, an effective niche pick, used exclusively in BC Core teams, tops this with a whopping 90% win rate over 10 matches. 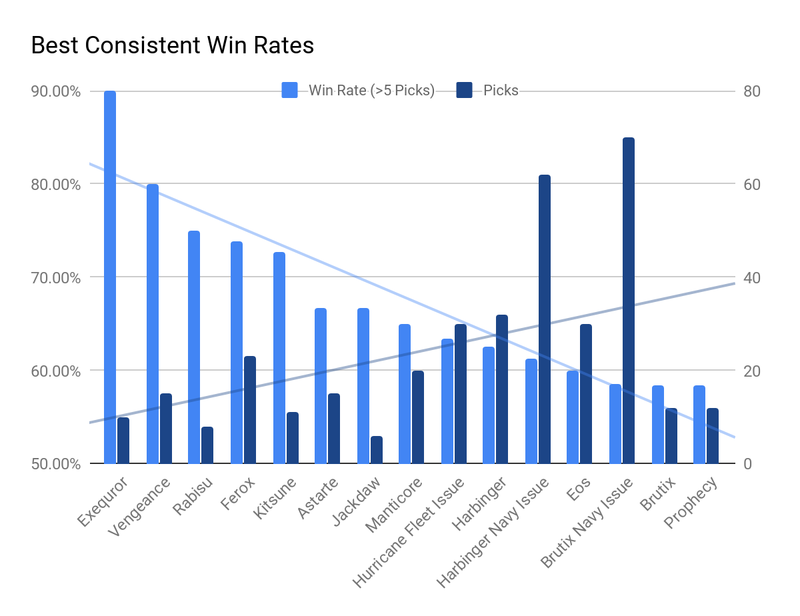 Typically the trend --as shown by trend lines, woo!-- shows the more picks a ship has the lower the win rate. Wider use outside of specific comps, or even mirror matches all drag win rates down, or at least towards 50%. With this in mind, we still see a powerful set of ships with the top 5 win rates over 70% and the top 10 all over 60%. Surprisingly we see the Kitsune up at 74% for a small ship it can obviously have a dramatic effect on a match with its bonused jams. The HNI and BNI(Harbinger and Brutix Navy Issues) are worth noting, the most picked of any ships on the list they have a definite mirror match depreciation. In fact, the HNI and BNI have serious mirror match issues facing a 20% and 21% mirror rate respectively. This jumps all the way up to 22% when you consider them as a pair. Here we see surprisingly similar trend lines suggesting that any exceptional stats in terms of win or survival rate tend not to be sustainable across large numbers of matches. We see a very strong showing from the Vengeance though, no surprise for a fairly impotent highly tanked tackle frigate, it makes an unappealing and low reward target. Similar arguments can be made for the Jackdaw and Malediction with their good mobility and high damage mitigation keeping them out of the firing line. The other options are predominantly the heavier ships of comps, with all forms of Battlecruiser hull and Pirate Battleships all offering ships. This is due to the way matches tend to break down, with the tankier core often being the ships that survive a match, potentially even on a losing side simply due to the time it takes to kill them. The big surprise initially is the Rabisu, but the care with which it is usually fielded, combined with its good mobility and tank keep its survival rate higher than its pure T2 brethren. Finally, the Ishtar is the only ship left unaccounted for, with an incredible ability to kite due to drone based damage and range bonuses to it they can avoid damage long into matches making them difficult to kill even for a winning team. I have to issue somewhat of an apology for a lack content this week, I’ve had a tumultuous week outside of EVE and what free time I have has been spent practising for the coming matches. 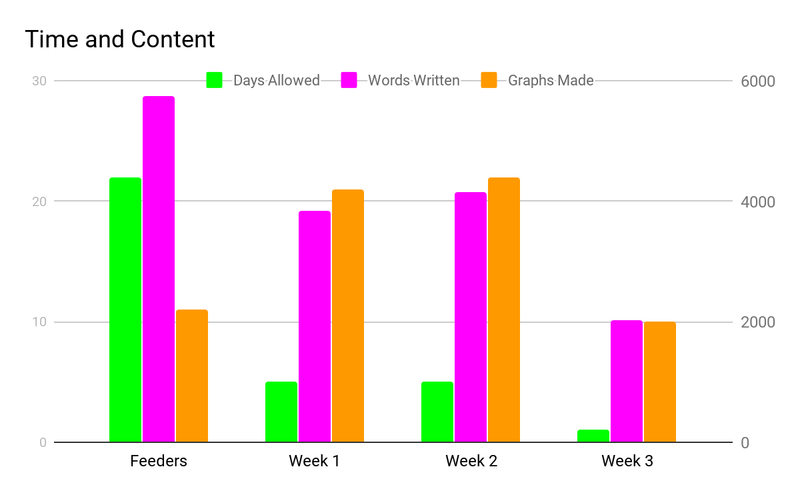 As such this may be the shortest --but hopefully sweetest-- stats blog I’ve written so far. Best of luck to all the teams competing and I’ll see you all in the inevitably thesis sized total information stats blog after. Oh, and we’ve had 4 new non unique ships picked since weekend 2, so pool use broke 50%!